Do you remember when you got your first tattoo? What was the experience like? I do remember getting my first tattoo. It wasn't planned and I wasn't quite old enough to legally get one! I'd wanted a tattoo for a while but wasn't sure what I wanted and thought I'd probably get one when I turned 18. However, I went to a tattoo studio with an older friend who was getting a small star outline on her back and on impulse I decided to get the same on my ankle. It was a little scary, but also very exciting. I loved the buzz of the needles and the adrenaline rush I got from being tattooed and was pretty much instantly hooked! Can you tell me a little bit about the two main tattoos on your left and right arm? My left arm is an old-school style sleeve done by a great artist based in Plymouth called Neil Pengilley. 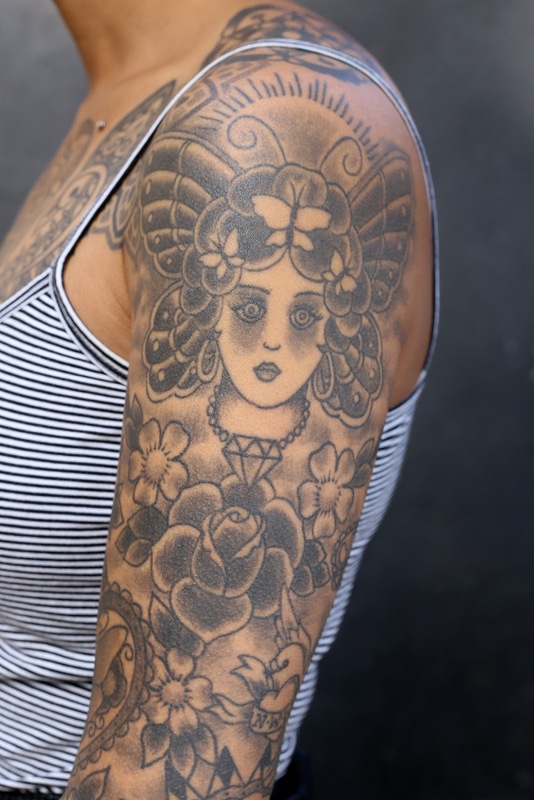 It wasn't planned as a sleeve, but started with the butterfly-headed lady at the top. After gradually adding designs one by one, Neil suggested adding some filler flowers and shading to pull everything together. I still remember the thrill of walking out of the last session with a full sleeve! The individual designs are mostly based on personal things like my star sign and birth number, as well as a few things to reflect my life's journey and love for travelling, like a compass to direct my way. My right sleeve was done by a brilliant artist called Saira Hunjan, who was based in London at the time. 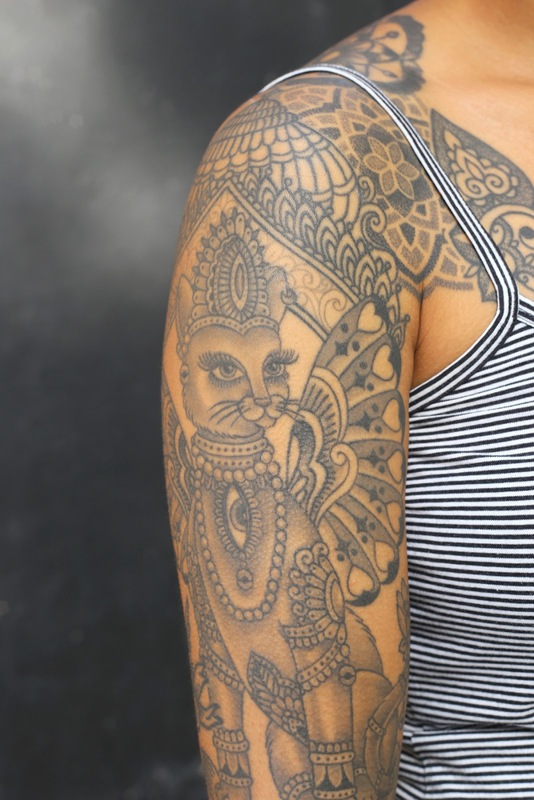 I absolutely loved her style and I'd wanted to get some work done by her for a while so when I decided my next tattoo was going to be a cat goddess, I knew I had to get Saira to do it. She designed the cat goddess and temple for me as a starting point and then I pretty much let her run with the rest of it as she had so many great ideas. A lot of the floral part was just drawn directly onto my arm as we went along and tattooed on the spot. 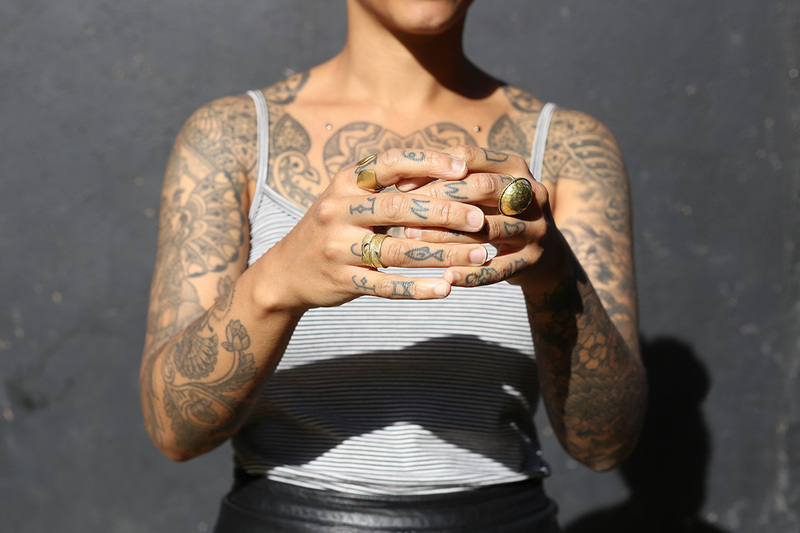 How do you find and settle on a tattoo artist? Finding a tattoo artist I'd like to get work from has become much easier since the advent of social media. I follow a black work account on Instagram and then check out the featured artists accounts that I like. Before that, I used to regularly buy tattoo magazines and then google the artists I was interested in to find out a bit more about their work. After deciding on someone to tattoo me, I'll have a face to face consultation, if possible, to get an idea of the type of person they are and what kind of environment they work in. I wouldn't get any work done by someone who wasn't approachable, open to having ideas thrown at them and honest with their opinions. 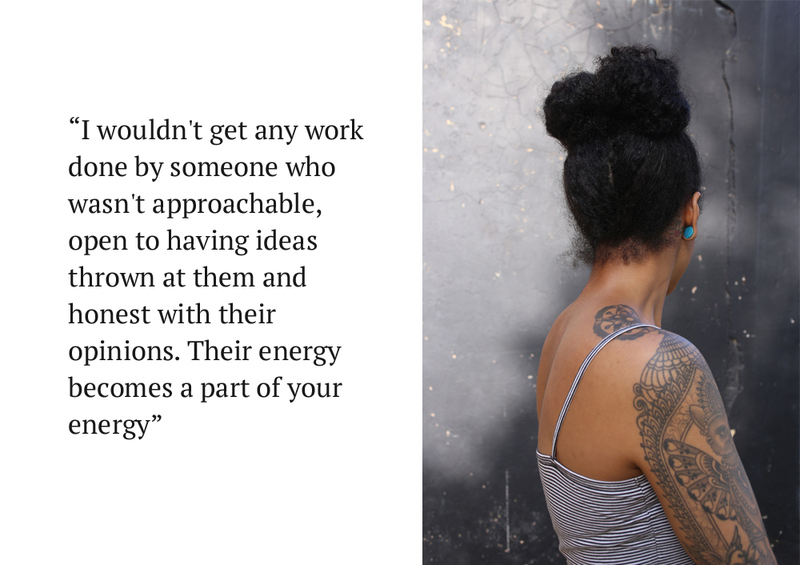 Their energy becomes a part of your energy so regardless of how great an artist someone is, if I wouldn't feel comfortable spending at least a couple of hours in their company then I wouldn't get tattooed by them. I love the Johnny Depp quote "my body is my journal and tattoos are my story" so much so that I have a tattoo inspired by that quote on the back of my leg! 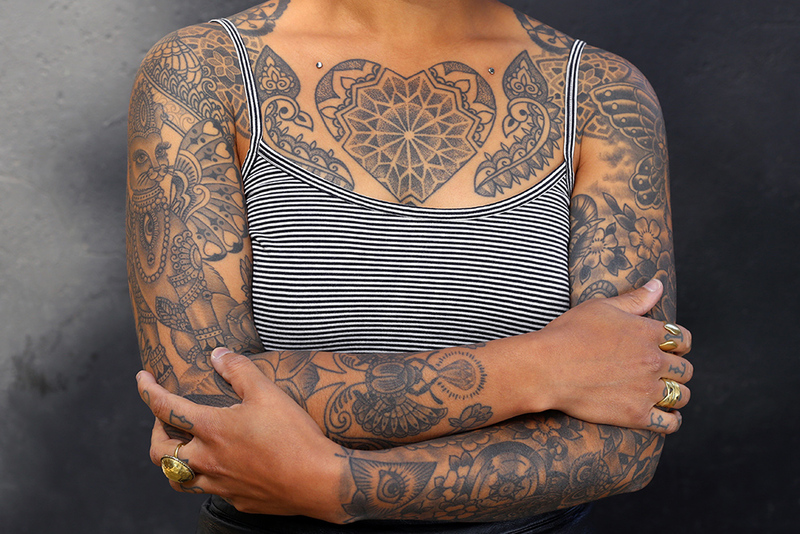 The design is a book filled with all the tattoos I'd had up until then with a tattoo gun drawing them in. I love that my tattoos tell the story of different times and events in my life; different stages of my journey. I have permanent records of my first tattoo experience, my travels, my family and my friends, amongst other things. It's this personal map, as well as the desire to collect beautiful artwork from the endless selection of great artists out there, that keeps me going back for more. 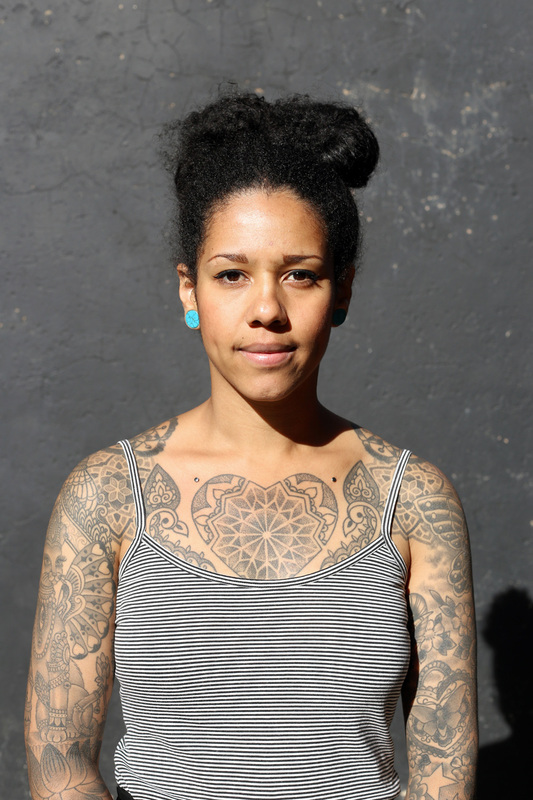 How would you summarise your relationship with tattoos? As a creative person, to me tattooing is just a very permanent way of expressing my creativity. 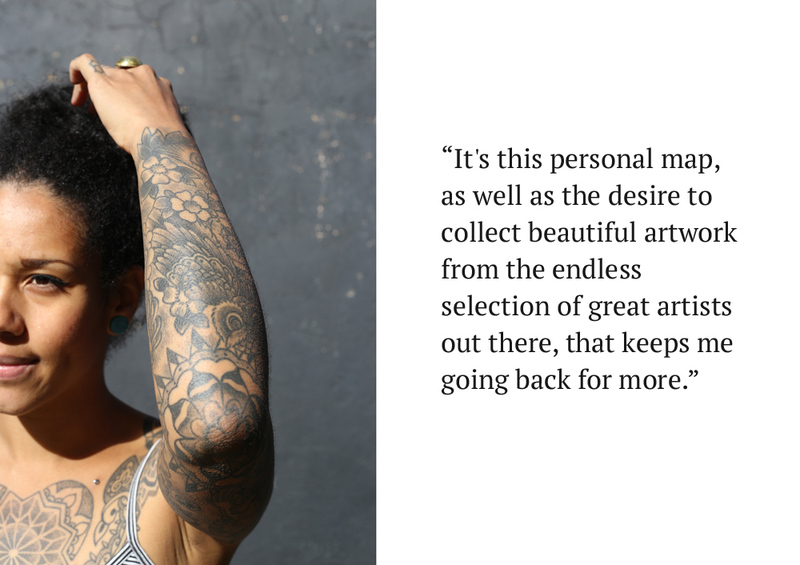 When I started thinking about tattoos it was almost an intuitive curiosity, an itch I had to scratch. As I've gotten older and become more enlightened on the artform, it's become much more about creating a beautiful second skin. It can be cathartic at times, and although I never initially planned to be as covered as I am, it's always felt like a natural progression. 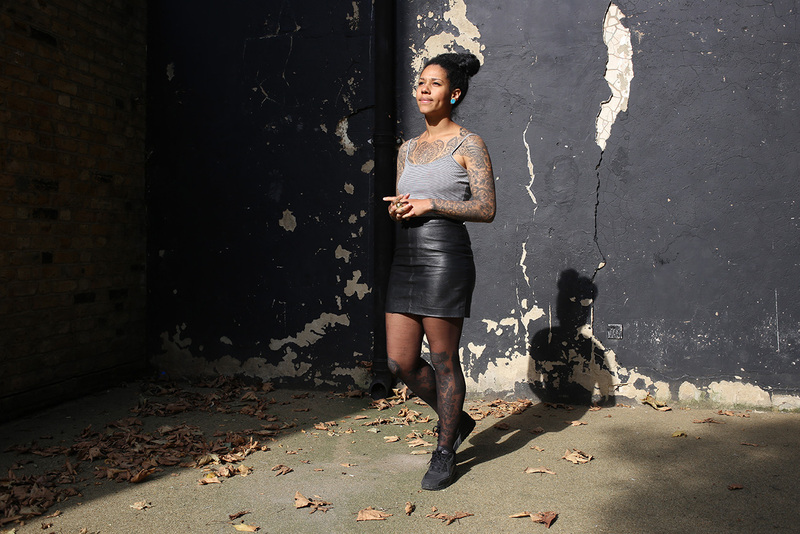 With tattoos and being tattooed, I've found my happy place and I aim to be fully covered… well nearly: although there are some amazing tattooed faces out there, that's where I personally draw the line. I've not had any doubts since I started, but the one thing I do worry about is not being able to have the time or money to finish the rest of my body! One of the main things I've discovered about myself through the process of thinking about tattoos is that the ideas that pop into my head when I start thinking about my next design are usually the ones I end up running with and getting tattooed. Anything I have to think too long about usually doesn't develop into a design as I start overthinking things and the result is then an overly complex design that doesn't feel right. I'm at a point now where I've got a fair bit of coverage so I'm not as obsessed with having work that has a lot of meaning behind it. I've still got a few large areas left to fill and am keen to get big designs by artists whose work I love and who I'd be happy to let fill the space with something that they've designed with only a little input from myself.